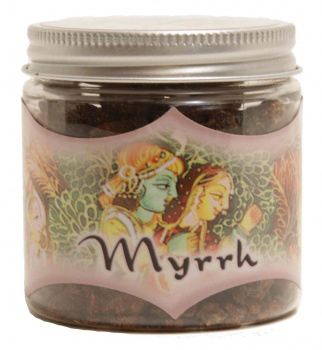 Myrrh has been used as a cleansing, purifying agent since ancient times. It possesses a richly bitter scent. Inhale the scent of the burning myrrh resin, more properly called oleo-gum-resin, to awaken your awareness of the spiritual reality behind our everyday existence. It is a great tool to use before prior to or during religious rituals as it strengthens the link between our crown and base chakras. The result is expanded awareness, the calming of fears and halting the questions concerning the future. It is helpful in evoking tranquility, calms the nervous system, promotes healing, and eases sorrow and grief by helping to heal the wounds caused by the feelings of loss and rejection. Ramakrishnananda's Resin has authentic aromas that are so powerful that half a tea spoon on a small charcoal will fill up your entire home or business with a mood transforming scent. For a complete purification ceremony use after smudging with Sage.